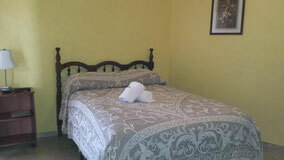 - Includes 2 full beds for two adults and 2 children under 12 yrs. - Private Bathroom, Air Conditioner. TV and WiFi. Check In: 3:00pm, Check Out 11:00a.m. 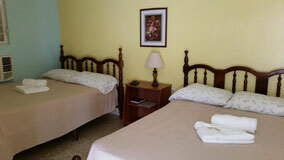 We are a family hotel: Guests must arrive before 8:00 pm. Early Check In, Late Check Out available - additional charge will apply. Two adults and 2 children younger than 12 years. $25. charge per night for each additional adult. A security deposit of USD 50.00 is required upon arrival for incidentals. This deposit is fully refundable upon check-out and subject to a damage inspection of the accommodation. Cancelaciones | Cancellations: To cancel and / or postpone reservations call 1-787-864-5124 to report 2 days in advance. No shows or cancelling out the term established, automatically voids the reservation.